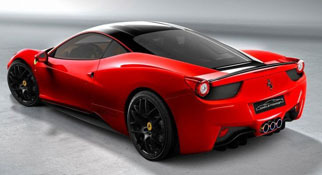 The Southern California sunglass manufacturer has been know to dabble with Porsches, well now they have unveiled at SEMA this year a custom Ferrari 458 Italia. 4.5 liter 570 hp V8 engine, 0-60 in 3.0 seconds, top speed of 205 mph, Oakley designed front and rear spoilers, lighter and wider blacked out HRE rims. This is one of five that Oakley will have built to promote its brand in the Super car market.